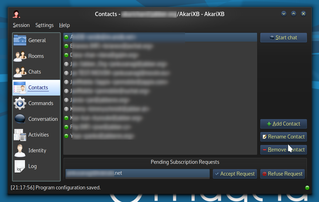 I've released a new version of my Jabber/XMPP bot with a GUI, AkariXB. When joining a chatroom (MUC), old backlog messages will not be processed. Added a menu option to abort ongoing (maybe stuck) connections. Added basic documentation in a help window. Nicer, categorized logging, including subscription-related messages and presence errors, and using rich text formatting. Basic contact list (roster) management. Also, 3 of the available translations, French, Spanish and Catalan are complete now.